CB-400/CB-400S Maintenance - NexSens Technology Inc. If possible, store the buoy near a window facing south to prevent excessive draining that can be harmful to the rechargeable battery. Alternatively, bring the buoy outside on sunny days to periodically charge the battery. 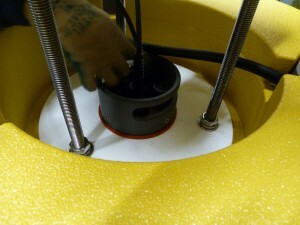 CB-400S configurations ship with the RBP500 Rechargeable Battery Pack preinstalled in the buoy hull. The RBP500 includes an internal 8.5 A-Hr sealed lead acid (SLA) battery that is recharged by the 10-Watt solar panel assemblies. The typical lifespan of the SLA battery is 1-3 years. The battery should be replaced as needed or a minimum of every 3 years. Removal of the buoy tower is necessary in order to access the RBP500 for removal and replacement. To gain access to the hull, the SDL500 must first be removed from the tower. 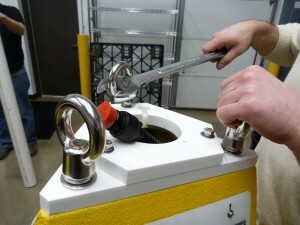 Remove the 3/8”-16 bolts from the buoy top lid and store in a safe location. 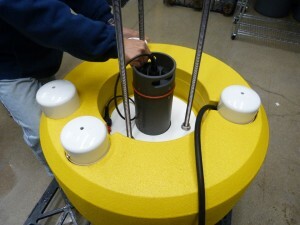 Carefully pull the SDL500 through the top of the buoy to expose the sensor connections on the bottom bulkhead. Disconnect the UW-1P cable from port P0 and any other sensors connected. Set the SDL500 aside with the buoy top lid. Next, the topside stainless steel eye nuts must be removed. Use a large wrench to loosen the eye nuts. Remove the eye nuts, lock washers and washers and store them in a safe location. Remove the lid and store with the eye nuts. Gently lift the tower upward from the hull. Prop the tower about 12” above the hull, or have an assistant hold the tower in this position. Remove the solar panel power cable from port D on the top RBP500 bulkhead. After disconnecting this cable, continue lifting the tower until it is free from the buoy. Set this aside with the SDL500 and other hardware. Be careful to avoid damaging the PVC guide pipes that protrude from the bottom of the tower. Lift the RBP500 up from the buoy hull to remove. Make sure the replacement RBP500 has an orange O-ring installed around the top to hold it in place. Lower the replacement RBP500 into the hull chamber. Reconnect the UW-1P cable that connects the RBP500 to the SDL500 to Port 0 on the top bulkhead of the battery pack. Carefully slide the tower back onto the hull. Feed the UW-1P cable that connects the RBP500 to the SDL500 through the center of the tower so that it can be reconnected to the SDL500. Before lowering the tower completely, reconnect the solar panel power cable to Port D of the RBP500. Important: Double check for O-rings on the UW connectors and inside the RBP500 and SDL500 ports. Reconnect the UW-1P cable and any sensors to the SDL500. 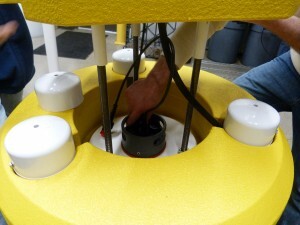 Reinstall the SDL500 inside the buoy tower. 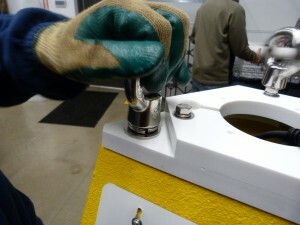 Tighten the eye nuts using a large wrench and reinstall the buoy lid. For eye nut reinstallation, set a washer and lock washer onto the lid at each location. Tighten the eye nuts by hand or with a large wrench as needed to flatten the lock washers.